The folks at Everyday Speech have provided social skill educators with a fabulous resource – 80 + social skill videos for learners from early elementary school up through high school. 10) They use REAL kids! It is so important for our learners to see real-live kids on social skill videos, rather than animation. There are many opportunities to analyze subtle non-verbal cues and tone of voice changes with the kids on these videos. 9) Explicit social perspective taking tools – the videos use “thinking bubbles” insets of each person in the social scenario to clearly communicate what each person is thinking and intending. This visual element of the videos is essential to teach kids about the hidden components of social communication. 8) Accessibility! These videos are accessible anywhere! Mac, PC, iPads, Android tablets, smartphones. You can use these tools with student groups using any form of technology. You can even watch them “offline” on your iPad with the VHX app. So, if you have spotty WiFi access in your classroom (like I do! ), you can still use them easily with your students on an iPad. 7) A variety of purchasing options! Everyday Speech offers a variety of purchasing options, no matter how big (or small) your instructional budget is! Probably, the best option is to purchase the yearly subscription and access ALL 80 videos (plus the new videos coming out this winter) for a yearly subscription rate of $49.95 right now (as of 9/27/15). They also have other bundle packages to target specifically the elementary age videos, or the secondary age videos. Think about this…. have you ever purchased a DVD from company creating video modeling sets – at $30-$40 per DVD? I surely have. You may get only 12-15 social skill vignettes on a DVD. For a few dollars more, you will have instant access anywhere to 80+ social skill vignettes! 6) Great for General Education classrooms! Do you work in a school that has a school-wide character education initiative, or positive-behavior support framework? Perhaps you are in a middle school that has weekly class meeting in your homerooms to target social issues. These videos are perfect for these settings as well – each video lasts roughly 2-3 minutes – add in 10-15 minutes of group discussion time surrounding the topic, and you have a built-in resource for a weekly class meeting venue. 1) Lesson Plans… done. 🙂 Each video offers so many moments to pause, re-watch, role-play and discuss the social concept with groups. Think about this…. 80 videos…. most folks are in school for 40-41 weeks a year. 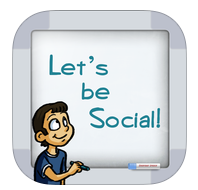 You could use 2 videos a week and have a relevant resource for your social skill groups all year! Browse all of the Everyday Speech videos with screenshots and brief descriptions here: https://everydayspeechsocialskillsvideos.vhx.tv/browse – This is a fabulous resource! !